10/28/18 UPDATE: Originally, this was an exclusive design for Happy Yarn Mail – a monthly crochet kit subscription that ended mid-2018. 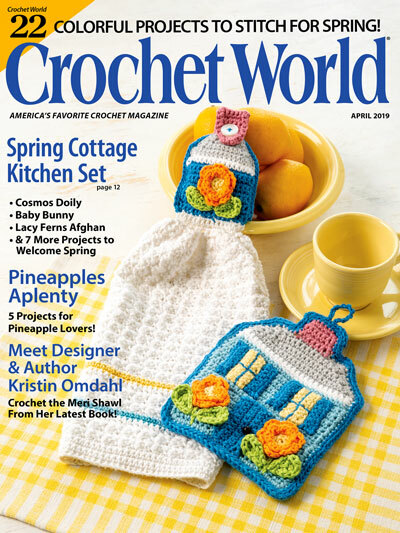 After Happy Yarn Mail ended, designer Ashleigh of Sewrella published the pattern for free on her blog. This week, I received my first package from Happy Yarn Mail! I have been feeling quite a bit uninspired and unmotivated lately, so this package couldn’t have come at a better time. I was so excited to see what was in my package, I couldn’t even wait to get home to open. I got back into my car from the post office, and opened it right then, and there. Everything was package up so nice! I found two skeins of yarn – the Touch of Alpaca Yarn, and some DIYarn, a button that says, “You’re Cute as a Button”, a Yarn Party sticker, and the pattern printed on some glossy paper, folded like a pamphlet, and covered in a pretty floral print all wrapped up in a bright pink tissue paper. This definitely brought me lots of happiness and excitement. I came home and got right to work. Yarn Alternatives: Lion Brand’s Vanna’s Choice, Lion Brand’s Wool Ease. This was my first time using Touch of Alpaca Yarn. I have used alpaca yarn before, and sometimes, it can be itchy, but this one was soooooo soft, and a bit squishy. This yarn looks like and feels like Lion Brand’s Vanna’s Choice Yarn, which if you’ve ever worked with it, is soft and squishy, and kind of feels like wool. I worked with Vanna’s Choice quite a few times in the past. The last time I used it, I washed a pair of slippers that I was so happy with, and they came out so fuzzy. I was so disappointed, and tossed the slippers after. My fear is that this yarn may do the same thing. I haven’t tried washing my hat to test yet, but keep this in mind if you do wash a project, and please drop me a line with your finds if you do. I will say, I had to rip back my work in the body because I worked single crochets first before realizing it was supposed to be half double crochets, and in the first round to get even stitches, and with my ripping back and reworking, the yarn held up great. I attribute this to the acrylic. This yarn is comprised of 90% acrylic, and 10% alpaca, which means this yarn will have a good bounce back and stretch from both of these fibers, but it will also be more durable because of the acrylic, and feel better against the skin because of the alpaca, as long as the wearer isn’t allergic. Overall, it was a really nice yarn to work with. I have plenty left over to work up some swatches to test out in the wash for fuzz and shrinkage, and if all goes well, then I can’t wait to use this yarn so more! It would be perfect for a scarf, cowl, coat, mittens or simply another hat. Without adding the heart, I was able to work up my beret in just over two hours. This beret is designed to fit the average teen/woman. First things, first. 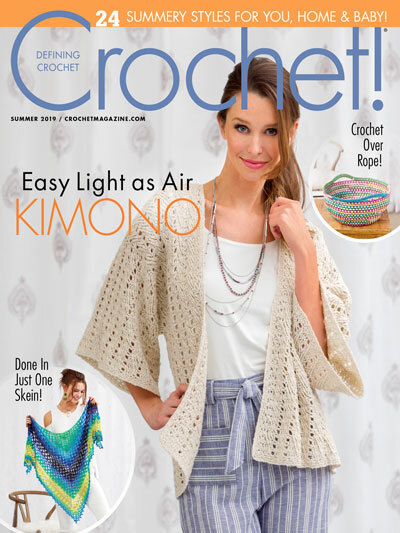 The pattern gauge is 3 half double crochets by 2 rows equals 1″. As you can tell by my gauge above, mine is smaller than the patterns. 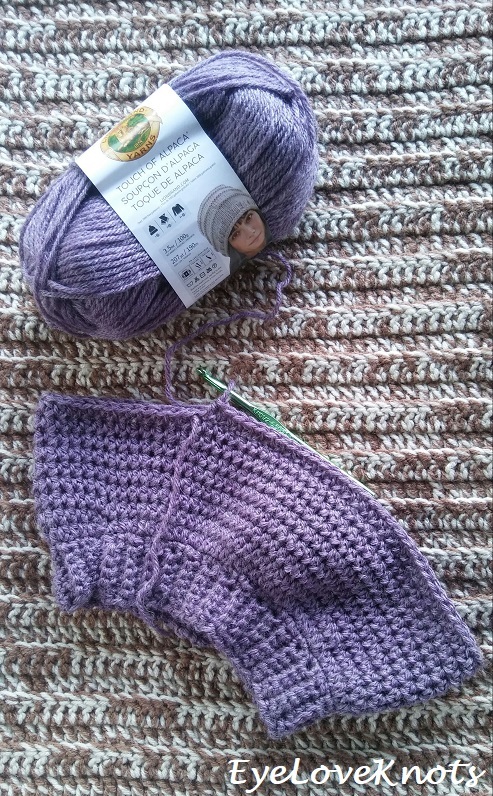 Originally, the pattern suggests to use a J10/6mm crochet hook, but I did not meet gauge with a J hook. I tried the K hook next, and even tried an L11/8mm hook. Why I went with 12 half double crochets as my gauge base? I had to find a common multiple so that I could compare my gauge with that of the patterns. The width is very close, and that’s why I picked the K hook. It’s much easier to adjust the height, than the width. To help with the gauge being a little off, I added one chain to the foundation chain of the band. At the end of the band, mine measured 17.5″. Given that ribbing usually stretches about 4″, I added two more rows to give me 18″ long, to fit my 21.5″ head. My band came out perfect, with room. To work evenly into the band, if the rows are worked as written (66 rows), work single crochet into the first stitch, single crochet into the next stitch, skip the next stitch, and repeat the pattern around. In my case, I worked a single crochet decrease first, then continued in pattern until about half way, worked another decrease, and then finished in pattern. I also worked the next round with one single half double crochet in the first, and last stitches to be on track with the 90 stitches. 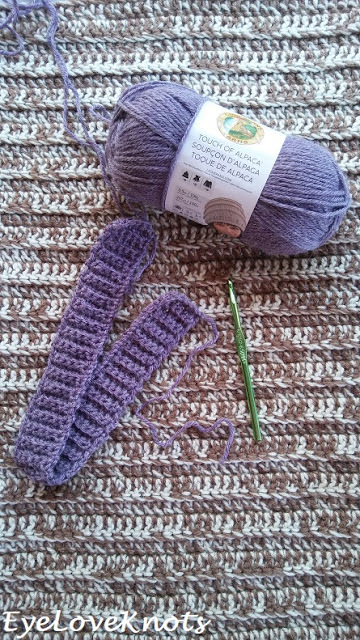 Going back to my gauge, my height was 4 3/16 after 10 rows, when it should have been 5″. 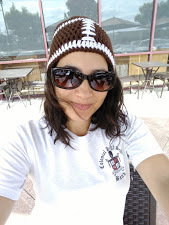 With a little math, I found that I would have needed to add two more rows to be closer to the 5″ mark, so I added two rows to the body of my hat to better reach the height. I also added another round after Round 17 of the crown, but of half double crochet all the way around, then I continued in pattern. 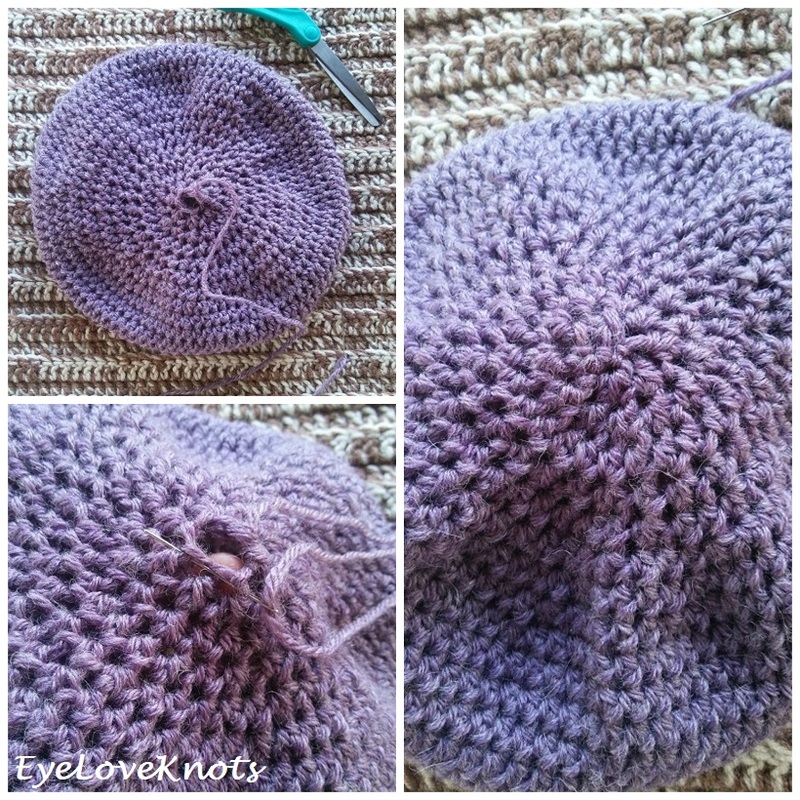 To close up the hat, you will weave your needle in and out of the last round, then pull tight, and weave in your end on the wrong side of the hat. To add the stem, I first laid my beret flat, and positioned it so the back (joined part of the band) was on the top, then I placed the stem with the curved part towards the top, and point towards the bottom, with the base at an angle – about 10am and 4pm, if you know what I mean. I looked at the picture for some guidance, but it was a little hard to tell. You could position it any way you think is best. After the position was to my liking, I used my crochet hook to pull the ends down through the center round, tied the two ends in a square knot on the wrong side of the beret, then weaved in my ends. 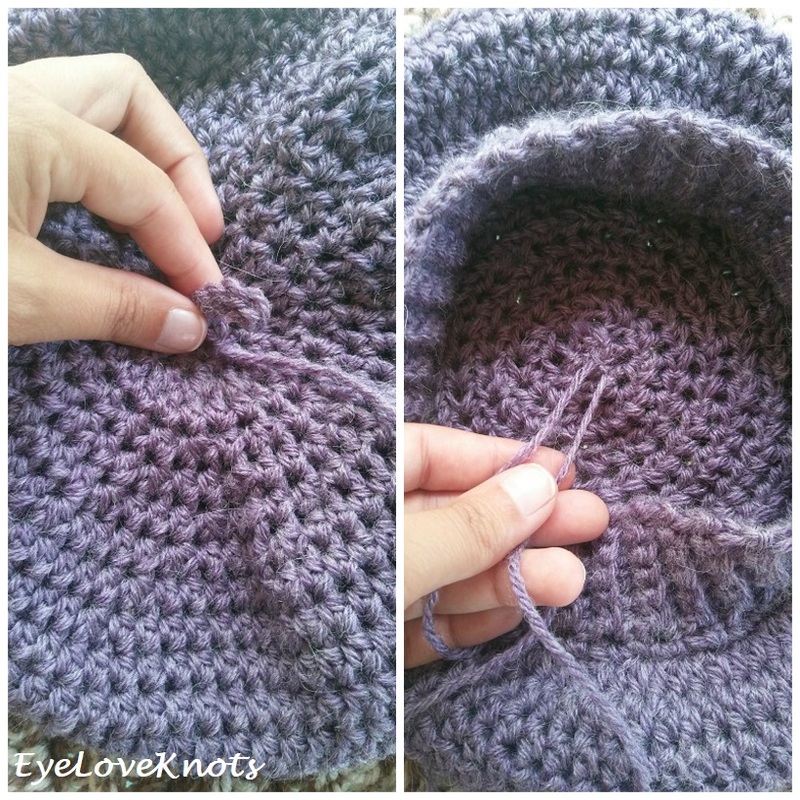 Besides my trouble meeting gauge, this hat pattern was very straight forward, and easy to follow. There aren’t any how to photos, but there is a video available if extra help is needed working up the beret. I love that I was able to try a different yarn, one that I probably wouldn’t have otherwise purchased. Even if I had tried this beret, I probably would have just used some of Hobby Lobby’s I Love This Yarn out of my stash, so this was great. This beret is so cute, and sweet. I love how it puckers from the decreases, and the fun little stem on top. This beret fits so wonderfully, and feels great against the skin. It would be an excellent gift, or make for yourself. It could easily be worked with, or without the cross stitch heart, depending on the look you are going for. 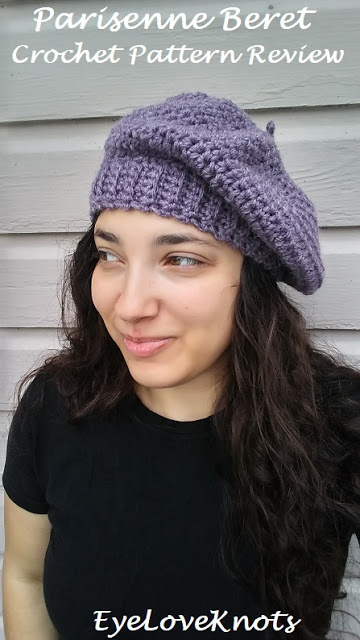 I opted not to add the cross stitch heart to my beret only because I wanted to gift the beret, and I don’t know how the heart would have gone over, but I knew the color was perfect! 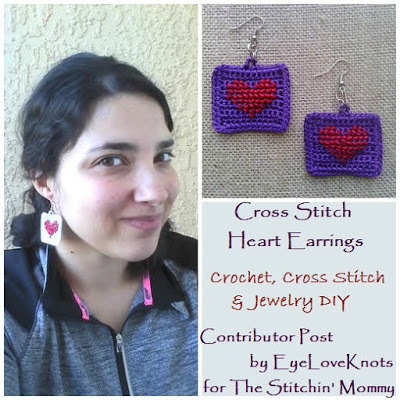 If you do add the heart to yours, you may also like to work up a pair of my Cross Stitch Heart Earrings to match. Bacon, Onion & Pepper Pizza – My Favorite! Love the purpleshade and I can even see the softness of the yarn on your pictures! Paris is quite a popular theme these days. I definitely recommend trying out the Touch of Alpaca yarn. You will love it! wow beautiful, love this desing of french beret! i like wearing and making beret for me and my friends! In high school, as part of my marching band uniform, I wore a beret, and I love it. It was as bright, and stylish as this one, but nonetheless, I love the fit and style of berets. Wish I had more time to wear them before it was too hot out though. It's a lovely beret and that yarn looks great, a beautiful colour. Oh yes, I am in love with the color! It's lovely, great color too. Thank you for sharing at The Really Crafty Link Party. Pinned. 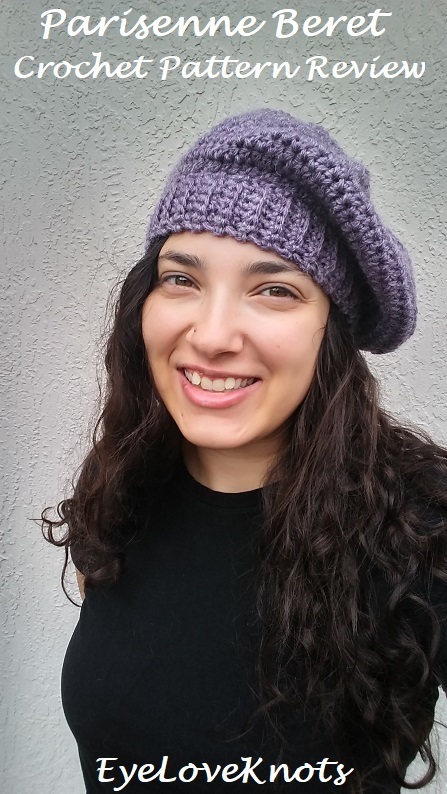 Ashleigh did a beautiful job designing this beret, and choosing the color for us all to use. 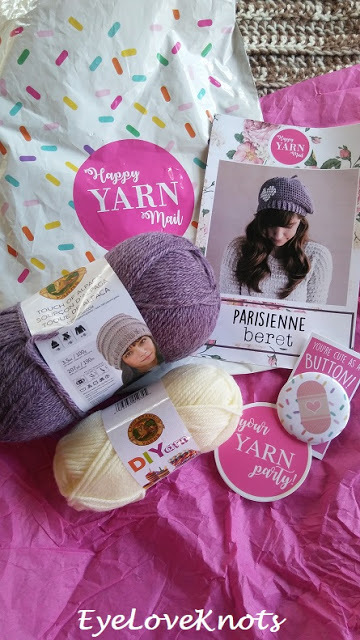 I had a lot of fun being a part of Happy Yarn Mail, and sharing at your party too! You look so good in a beret! How lovely! I think this is a hat that I could actually wear next winter! I would be happy to make one for you in any color of your choosing! Would love to see how you use it to embellish one of your outfits! What a great beret. I love a hat with a bit of "slouchiness". My sister loves Beret's – I may try this out for her birthday! Have a great weekend, and thanks for linking up!